After CWD’s red, Devoucoux’s green and Morand’s orange, it is the turn of Butet’s saffron and chocolate to become a part of LIM Group, Leather in Motion. This group is dedicated to promoting French leather and within it, the most beautiful, high-end riding saddle brands and luxury glove-making exist side-by-side. The group, which also owns Les Tanneries de Chamont, the saddle tree makers Lariot, and the manufacturer Saddle Choice, is constantly striving to secure supplies. Each French company has been awarded the prestigious French Entreprise du Patrimoine Vivant (EPV) label. They will exist harmoniously in Dordogne, Anjou and the Basque Country. • Ensure the economic and social development of all the distribution markets, in France and abroad. • Have additional resources to sustain its investments, innovations and expertise. • Have larger negotiating margins with its partners and suppliers. 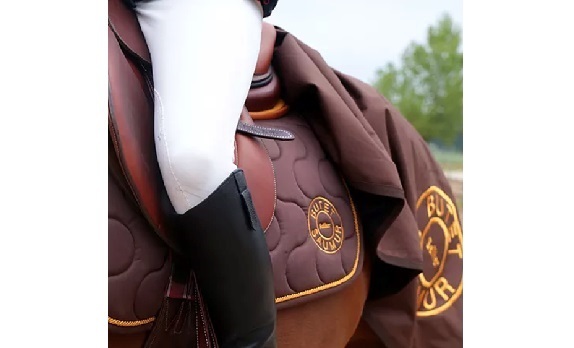 Created in Saumur in 1985 by Fréderic Butet, the saddle and harness-maker rapidly conquered the world’s clientele by word-of-mouth with refined models in keeping with minimalist riding. A “rider-horse” philosophy which epitomises lightness, close contact and a way of riding and being with a horse which reflects an entire lifestyle: harmonious. This harmony is reflected in the relationship built with Arnaud Lièvre and Olivier Perdrix, the joint directors of Butet, to purchase their company..
“The company was in need of investment to retain its level of excellence. We didn’t want simple financial backers but someone from within the industry to continue the adventure. I have a great deal of admiration for LIM Group and the way the company controls the value chain from A to Z. Our meeting with Laurent Duray was mutually beneficial. Through our discussions, I quickly realised that selling the company was the best solution. We can no longer ignore one another because Butet is a gem which will give even greater meaning to LIM Group”, says Arnaud Lièvre, Butet’s Marketing and Joint Director. Although Frédéric Butet has now “retired”, his design and Anjou-made saddles continue to appeal to thousands of riders around the world. “I met him a few years ago, he often spoke about expertise and knowing what to do. We immediately knew what to do when Butet’s current owners, Arnaud Lièvre and Olivier Perdrix, approached us about their merger plan,” says Laurent Duray, CEO of LIM Group. CREATION OF SYNERGIES WITH THE GROUP. This Tom Thumb of luxury French saddlery manufactures 2,200 saddles every year. 40 members of staff work in Saumur and in sales. 70% of its €5.3M turnover comes from exports. It has a small catalogue and the models of saddles have no names. Riding with a Butet saddle is the same as driving a Bentley. Continuing to manufacture saddles in Saumur is a prerequisite for this acquisition. “The production of saddles in Saumur in France is at the very heart of the brand and is a marker of the quality sought after by a demanding global clientele, who could quickly distance themselves from it, if the “French manufacture” prerequisite no longer existed. “Made in France” is a key issue for the sustainability of the Butet brand. The expertise of Butet’s artisan saddle makers is remarkable. LIM Group is proud to be the new guarantor of this unique expertise,” concludes Laurent Duray. The challenge now within LIM Group will be to create the best synergies possible while scrupulously protecting the DNA of each brand and satisfying all types of customers. Every brand in this group remains commercially independent, with its own identity, expertise and raison d’être. A great way of allowing leather to continue to progress. Lim is an acronym for “Leather In Motion”. The guarantor of the values of excellence in French riding saddlery, it also upholds the long-standing expertise of luxury glove-making in Saint-Junien, the tannery in Saint-Pardoux-la-Rivière and saddle trees in the United Kingdom. The French EPV (Entreprise du Patrimoine Vivant) label has been awarded to each of its French companies. LIM Group’s Butet, CWD and Devoucoux, Morand, Tanneries de Chamont and Lariot brands are designed for an international, top-of-the range, tailor-made market in which every pillar counts: Innovation, Investment, Expertise, Customer Relations, After-Sales Service and Training. Its model is unique in the world as it controls the value chain from A to Z, from the animal hide right through to placing the saddle on the horse’s back or people wearing their gloves. LIM Group provides saddles to the best riders in the world as well as enthusiastic amateurs with models of saddles that have become legendary. The group is forwardlooking and committed to a sustainable development approach: the use of 100% vegetable-tanned leathers, saddles which are renovated for a second lease of life, the creation of a Pôle d’Excellence Rurale (rural hub of excellence) and reducing arduous tasks for its workers. In terms of figures, LIM had a turnover of €50.5M in 2017, 60% of which was exports and 546 members of staff with employments contracts in 12 countries across 4 continents.